As the prime minister rose, Big Ben sonorously struck thirteen. What was happening? Had the UK courageously entered an entirely new time zone, remote from our neighbours, free from any lingering continental shackles? 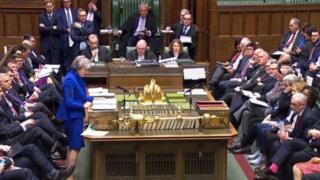 No, it was undoubtedly a timeous tribute to the Orwellian nature of discourse in this House of Commons, here assembled. Jeremy Corbyn, the one-time apostle of goodthink, set the tone. He accused the prime minister of "Orwellian language" with regard to the redrafting of documents defining deprivation. It was apposite. Much Brexit debate has been infused with elements which might be traced back to George Orwell's literary efforts while ensconced on the isle of Jura in 1948. Critics of the prime minister say she is open to an accusation of doublethink. She campaigned vigorously against leaving the EU while now seeking to proclaim the potential advantages of Brexit: currency, borders and laws. Remember, though, that doublethink sounds a note of praise when used of a colleague. Her supporters praise her for pragmatism. Perhaps, in any case, the relevant description is blackwhite: the ability to stress vigorously and volubly that things are other than they seem, and indeed have never occupied any alternative position. 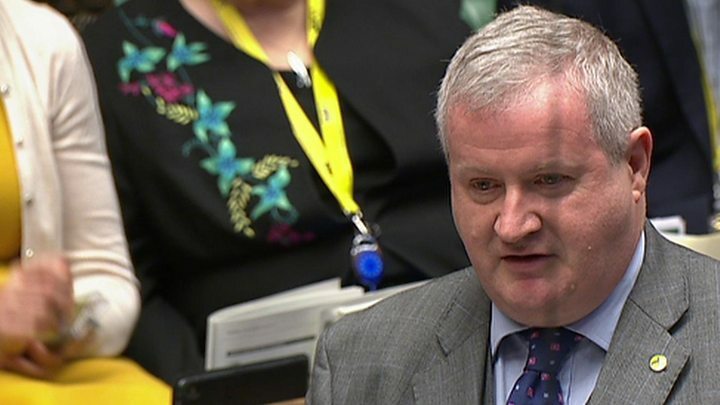 At the same time, Ian Blackford of the SNP seemed to feel that the PM was in the grip of oldthink, an outdated concept that matters could be progressed through a private deal with the Leader of the Opposition. This was, he reckoned, duckspeak - unthinking political orthodoxy. There could be no faith in a backroom deal "cooked up by two leaders" who could not command their own parties. Remember, though, that duckspeak is also a word of praise when used of a pliant supporter. Frankly, Theresa May could use a few more quacks of endorsement from her own side. As the insults and attacks multiplied, one could detect a widespread epidemic of facecrime, even on the two front benches. The cheers were audible. Ditto the cries of "hear, hear". One or two even waved their dayorder papers. But their heart was not in it. The bellyfeel just wasn't there. Neither side could credibly claim to possess the overall solution to existing problems. Except, of course, by side-stepping them entirely. Which Mr Corbyn and Mrs May did by indulging in a prolonged battle over local government cuts, predicated of course upon upcoming local elections in England and Northern Ireland. One understands, of course. One appreciates that political leaders will, frequently, be driven by immediate electoral concerns. And perhaps, as I wrote here months ago, it is tempting for politicians to pursue displacement activities when confronted with a huge, immanent and seemingly intractable constitutional crisis. But remember where we are. Two days away from the already rescheduled date of Britain's departure from the European Union. Now dependent on supplication to the EU 27 for a further delay.